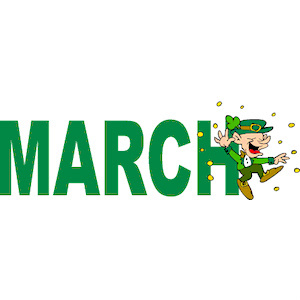 WELCOME TO MARCH, THE MONTH OF COLORS. You can't find my gold! FIRST DAY ACTIVITIES: Art for the month: Rainbow. On the first school day of March, after doing the 'Finding color' water project below, give each student a copy. For older students, give them the basic colors in tempera paints and let them mix their own colors,--Green, orange, and purple (mixed a little white when making purple.) 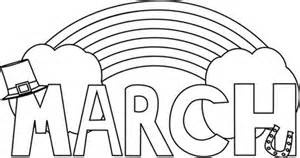 Using these colors to paint their picture (Hat can be black, Clouds leave white, and Mix brown (using all three basic colors) to color the letters. Let younger students pick out the colors from their color box, as you call out the colors that they will use to color their picture. Display their masterpiece on the Art Wall where you put the students art, preferably where the parent can see them when they come into the room. Keep these pictures up during the month of March. Using the basic colors, red, yellow, blue to find new colors. Let student fill two glasses half full of with water. They squeeze one or two (equal) drops of various food coloring into the water. Stir gently. Pour the lighter color into the darker color stir and watch colors blend together to make another color. This month of March we are talking about green. So to make green, use yellow food coloring in one glass of water and blue in the other glass. There are many other ways of making the 3 basic colors into orange, green, or purple. One is mixing tempera paint..(note if making purple add a dab of white paint. We use only these six colors on our art table until color concept has been learned by all students. 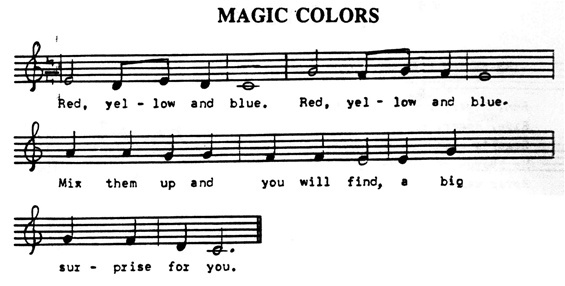 Verse 1: Red, yellow, and blue, Red, yellow, and blue. Mix them up and you will find a big surprise for you. Verse 2: Orange, purple, and green. Orange, purple, and green. Made from red, yellow. and blue. 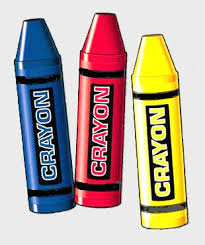 Every school accumulates broken or blunt crayons. You can dump them in the trash (wasteful) or create new usable and fun crayons with them. Here's how. Let your students work on peeling off the paper wrappers from each piece of crayon. Next break any larger pieces up into smaller ones. Arrange the colors however you like in a small ovenproof muffin tray. (Use basic colors to make other colors. 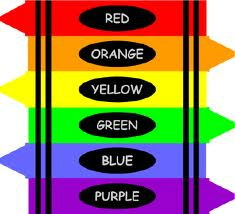 Melt red/blue together to make purple, yellow/blue to make green, yellow/red to make orange. Or use white added to basic colors to make pastel colors. Add all colors to together to make brown. 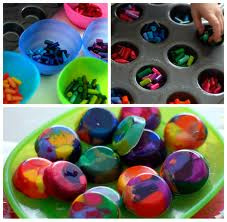 Place broken pieces into cupcake pan, putting different color mixture in each cupcake indention. place on cookie sheet to bake. (Teacher does this. Children watch but well away from the hot melted crayons.) Preheat over to 250°. Bake until melted which is about 10 minutes but keep an eye on them as some may melt quicker. Very carefully, so as to not spill any melted crayon, remove cookie sheet from the oven. As the crayons cool, they will harden. To speed up the process, transfer molds into the freezer after the crayons firm up. After about 30 minutes, remove molds from the freezer Once they are cool remove them from the molds by tapping them out. Place these home made crayons on the art table for use. 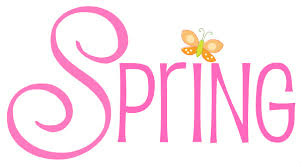 In some regions in the Northern Hemisphere, the astronomical March equinox (varying between 19 and 21 March) is taken to mark the first day of spring. Let your student have fun in the soil, feel it. smell it, and fill their cup. I suggest that they take their pointer and middle finger to make two holes in the dirt. Place a bean in each hole. (If one fails to grow the other one will thus save a disapointed child.) Water it well. place in sunny place, and give it a little water every other day, reminding your students that plants need both water and sun to grow. 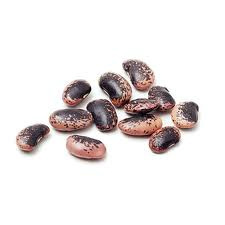 You will almost see this bean grow .. when it gets several leaves send it home. 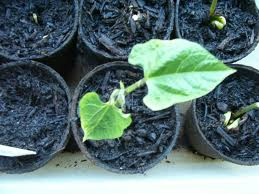 Sent note to parent advising them the this plant needs to be planted outside near a trellis. 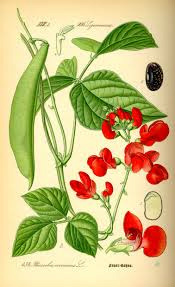 If cared for it will grow tall, and give out red flowers and editable green pods. Teacher: (takes Lindy from his place.) Good Morning, Lindy. I have a riddle for you. Lindy: I love riddles. They make me think. What is it? Teacher: What must stay in one space but can move? Lindy: Hummmm, if something stays in one place, it can't move. If it moves it would lose its place. Wouldn’t it? 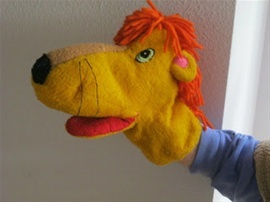 (Have puppet appear to be thinking hard about the answer.) I give up. What is the answer? Lindy: How can everything be the answer? Some things can move and some things can't move. (Lindy pushes on the chair with nose.) This chair can't move by itself. It has to stay in the same place unless someone moves it. But I can move. (Move Lindy around) See I can change my place from here to here. Teacher: Lindy, I didn't say 'place'. I said 'space’. The riddle is "What has to stay in one space but may move? Lindy: What is the difference between place and space? Lindy: Of course not. It's where you moved it. Teacher: But it still has its space no matter where I move it. Lindy: (shakes head) Excuse me, but I don't understand. Teacher: I'll show you. (Name a student) Will you please sit in this chair. (Child sits in chair.) Now Lindy, (child’s) place is on this chair, right? (Lindy nods yes.) (Child) will you please move to that chair? (Indicate 2nd chair. Child does as asked.) Now she has changed her place from this chair to that chair, but she is still in her space. Lindy: I could push her off and sit on the chair myself. Teacher: No matter how hard you try you can take her place but you can't take her space. She just moves her space away from you. Lindy: Oh, now I see. Your space goes with you everywhere you go. If you move, you still take your space with you. Teacher: That's the answer. Space that has something in it is called occupied space. All the rest of space on this earth is empty, or unused space. We can move in unused space but we can't go into occupied space. Lindy: And wherever my body is, is my space? (Touch chair) This chair has a space. (Touch wall) the wall has a space? Teacher: yes, everyone and everything has its own space. (To students) Can you tell Lindy more things that have their own space? Lindy: Everything on this planet has its space, including ME. Teacher: Yes, your space is yours alone and no one can take it from you. Each year as you grow older you'll get a little more space to call your own. Lindy: So the answer to the riddle, "What must stay in one space but can move" is everything that can move. Wow. I wonder if my friend, Merle Squirrel knows he has his own space. Excuse me. I want to find him and see if he can answer this riddle. Mark the day '17' on your March Calendar. Do you recall the ation on February's last school day before March, after reading the "Throw Away Hearts? We changed the red hearts to green and placed the green hearts together to become a Shamrock for March's room decoration. 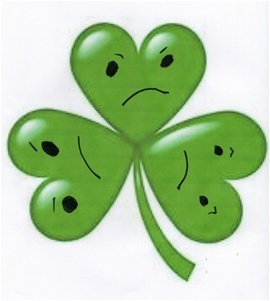 The day after St. Patrick' turn the green hearts to show their unhappy face. Make mention of how unhappy they are to be there when you change the day each morning.As before let students wonder why they are so unhappy. (Because they are no longer needed on the bulletin board in the month of April.) On the first day of April before children arrive, turn the hearts in pink, yellow, orange Happy Hearts with green stems and leaves and let them be Spring flowers for the rest of the year. Now they can always be happy hearts. St. Patrick's Day party time. Saint Patrick's Day is widely celebrated in America by Irish and non-Irish alike. Many people, regardless of ethnic background, wear green-colored clothing and items. 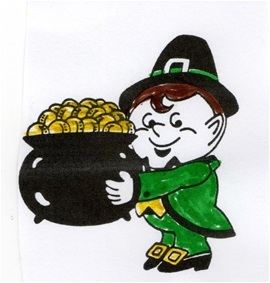 The leprechaun enjoys practical jokes on St. Patrick's Day. He usually takes the form of an old man, clad in green. He hides his gold so no one can find it--he hopes. On St Patrick's Day have fun with the crafty little fellow by hiding gold token (made from cardboard painted gold or plastic game coins.) around the room inside books, behind toys, any place that a child might not look, or on the playground. Can the students find the leprechaun’s ‘gold’? Give each student a small box or holder of some kind where they can deposit their token when they find one. (Making the box or holder could be an added art activity during the first of the month. Make sure name of student is on the holder.) To make it more exciting, (everyone knows a piece of cardboard isn't worth much.) have the student exchange his token for a prize. (A lollipop, small plastic animal, a helper at snack time, a sticker choice, to be leader for a day, anything you think a student would value.) 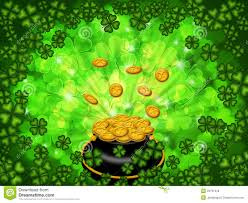 At the end of St Patrick's Day, students trade their coins in for the value of a prize. (Try to even out the 'find'. If students doesn't find as many as the others, "help" them hunt by secretly slipping a token where they can find it.) Have enough prizes so every student gets his or her share. 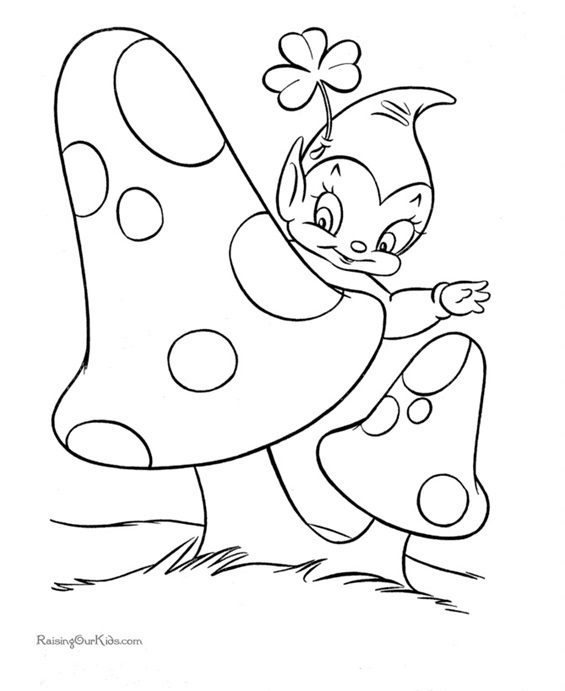 Verse 1: repeat 3 times: Leprechaun, Leprechaun, Where are you. 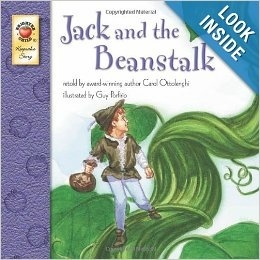 Verse 2: repeat 3 times: Leprechaun, Leprechaun, come back now. 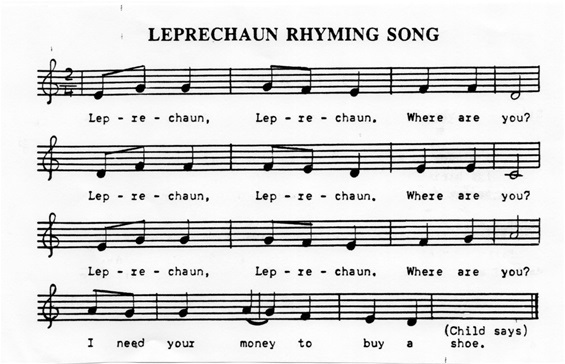 Verse 3: repeat 3 times: Leprechaun, Leprechaun, where can you be? You can add any rhyming word to the verses that would fit. For more fun use nonsense words that the students call out. 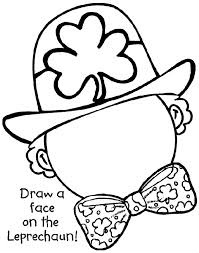 The Object of this activity is to have your student draw his/her own face on the leprechaun’s face. This is a teacher (or aides) hand-on activity. You will need a hand mirror and box of crayons or markers. The discussion is what is on our faces. This is a self-esteem building project. Praise every aspect of the student's face. Shape of eyes, color of eyes, eyebrows, shape of mouth. Notice that everyone has his or her own look, and encourage him or her to love what is reflected back from the mirror.